Do not install or uninstall anti-virus. Outdated virus definition and signature. Turf off User Account Control. Computer requires to restart after applying hotfix or update. These security concerns is relatively minor and can be safely dismissed, especially if the issue is purposely or intentionally done. In this case, the WSC Alerts icon and message can be turned off so that the system no longer will trigger notification when a problem occurred. If you can see the Security Center shield icon in the notification area, simply double click on the icon to open Windows Security Center. Else, click on Windows Start button, select Control Panel, and then Windows Security Center. Click on Change the way Security Center alerts me link in the left pane in Windows Vista. In Windows XP, it’s located under Resources section. 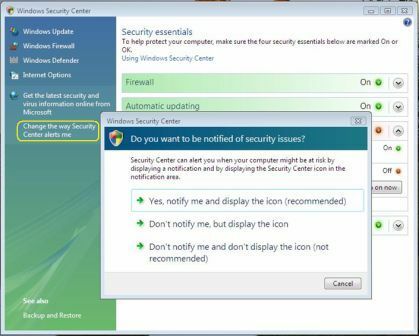 In Windows Vista, choose either Don’t notify me, but display the icon or Don’t notify me and don’t display the icon option, with later as complete disable of all Security Center Alerts. In Windows XP, a Alert Settings dialog box will appear. Clear the Firewall, Automatic Updates, and/or Virus Protection check boxes to disable the respective component’s alert, and then click OK.